The next morning we headed back up Highway 1. 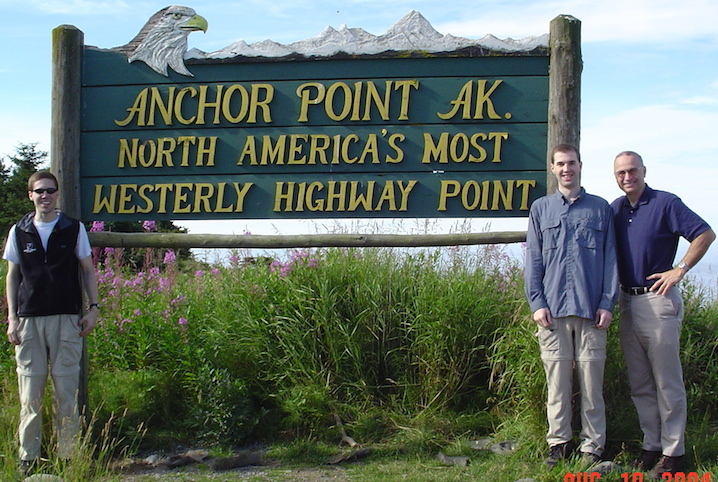 We stopped at Anchor Point, North America’s most westerly highway point for photos. We saw beautiful, but also dangerous, Mt. Redoubt in distance. The 10,197 foot is the highest summit in the Aleutian Range, but is also an active volcano. During its eruption in 1989, it spewed volcanic ash 45,000 feet up in the air that a KLM 747 unknowingly flew into before suffering an engine failure. Thankfully after a close call, it landed safely in Anchorage. Curiously, we watched a huge John Deer tractor launching boats into Cook Inlet. We had never see that before! We stopped back at Gwin’s Roadhouse in Cooper’s Landing for lunch before heading up Highway 1 to the split with Highway 9 to head south to the eastern side of the Kenai Peninsula. After a beautiful drive down the Seward Highway, we arrived in the port city of Seward located on gorgeous Resurrection Bay. Seward was named after William Seward, Secretary of State under Abraham Lincoln and Andrew Johnson. Seward negotiated the purchase of Alaska from Russia in 1867. Russian explorer Alexander Baranov first established a fur trading post at Resurrection Bay in 1793. Today it is a different kind of outpost as the southern terminus of the Alaska Railroad and shipping terminal for coal shipments and cruise ships. In fact, Celebrity Cruises, Holland America Line and Royal Caribbean all call at Seward. Many of them take train or bus trips into the interior of Alaska from Seward. Towering over town is Mount Marathon, home of the famous Mount Marathon Race. Every Fourth of July, runners race 3.5 miles round trip to the peak of the 3,000-foot mountain and return to the finish line back in town. After dinner along the waterfront, we headed to our hotel to have a good night’s sleep.